Warm Bodies — a self-described “zom-rom-com” (zombie romantic comedy), a term heretofore, one hopes, forever excised from this earth — took the top spot at this weekend’s box office, with a respectable $20 million. How did a flick starring relatively anonymous British person Nicholas Hoult just pull that off? (Don’t get me wrong — About a Boy? Skins? Nicholas Hoult is my dude. It’s just that, around here, he’s best known, if at all, for bedding Jennifer Lawrence.) The answer lies in Tween Nation’s unquenchable thirst for movies where vampires fall in love with humans. 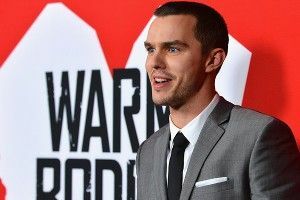 The flick, adapted by The Wackness director Jonathan Levine off the debut YA novel from Isaac Marion, stars Hoult as the aforementioned zombie, alongside Kristen Stewart lookalike (convenient!) Teresa Palmer as his love interest (not that this is something I really need to explain, but he eats her boyfriend, so he gets his memories, and so he falls in love with her.) And it was produced, for a cool $30 million by Summit, the same folks behind Twilight, who continue to prove they know how to push stuff on to young girls (in a non-creepy way! in a non-creepy way!) Says THR, “Women and girls made up 60 percent of the audience, while 65 percent of those buying tickets were younger than 25.” Says studio exec professional spokesperson type David Spitz, “The material was unique — we’re even joking it’s the biggest ‘rom com zom’ in history” (ah, David, nooo nooo nooo — thought we agreed never to say that again). “We made a conscious decision to sell this as a romantic comedy, versus as a zombie pic, and it paid off. Our marketing was amazing.” Off-putting self-congratulations aside, Spitz seem to be right here: They pulled the old counter-program move, running a movie during Super Bowl weekend for people who couldn’t care less about the Super Bowl, and they churned out a modest hit. Can’t get mad at that. Meanwhile, Sylvester Stallone’s new shoot-em-up, Bullet to the Head, cratered and died, with just $4.5 million. Sly, buddy — you couldn’t have waited until next week? There was football on.